Falafel is a grand vegetarian staple. It can be super delectable or super greasy! I choose super delectable! I bake my falafel and make into patties instead of balls to lower the amount of oil needed, ergo less calories and fat. Some restaurants will saute the falafel in oil instead of the more common deep frying. 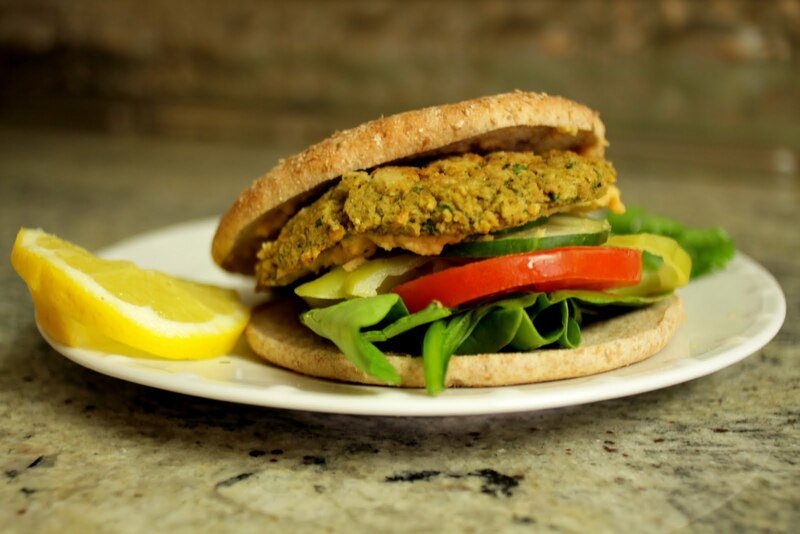 Add lots of extras such as hummus (check out our previous TVeg recipe see below), tomato, spinach, and peppers to the pita or sandwich to make it a great filling meal. Falafel is usually made with chickpeas (aka garbanzo beans and cece beans) but can also be made with fava beans. Don't waste your time with a prepackaged mix. This is a an easy dish to prepare! Line a baking sheet with parchment paper or coat with olive oil spray. Combine garbanzo beans, onion, parsley, garlic, cumin, coriander, baking soda, sesame oil and lemon juice in a food processor or blender. Process until mixture is coarsely pureed. Transfer to a bowl and stir in flour. Shape mixture into 4 large patties (about 3 inches by 1/2 inch), place on prepared baking sheet and let stand for 15 minutes. Bake for 25 minutes. After 15 minutes, turn patties over and bake for an additional 10 minutes. Serve with sandwich thins, hummus, tomato and spinach. Hot Summer Days and Gazpacho! !